'The Conclave' concludes as only it could, with a showdown between warriors. Jacob Hock demands a trial by combat and conveniently offers up his ally's Lazarus to fight the Carlyle's Lazarus, Forever, to the death. He doesn't have anything to lose as the maneuvering of chess pieces between he and Malcolm Carlyle continues but will it be Forever who has to pay the price? The charges against Hock were plenty, but it turns out he's even more conniving and ruthless than even a Carlyle. His petulance and menace in getting this one-on-one battle between Forever and her friend, the Bittner's Lazarus, Sonja, demonstrates his hate for Carlyle and to what lengths he'll go to dishonor them. Greg Rucka has forged a post-apocalyptic, dystopian future world that doesn't pander to readers with elaborate technology and fancy weapons of war. Even when Forever and Sonja face-off it's sword against sword. Sure, they've been engineered to be great fighters but Rucka doesn't use it as a crutch to tell his story. It's one of the wonderful things about this series. It relies on character development and drama found in the details of the story. It's futuristic setting has little bearing on the story as a whole. Of course, it allows the Lazarus to have some remarkable abilities but as cool as it may seem to be a super soldier, what resonates is the cold-hearted treatment by Forever's father during her development where she's looked at more as a tool than a daughter. What makes this issue so special is the fact that so much action takes place. Michael Lark goes to town on some beautifully choreographed swordplay, it's both brutal and virtually balletic. Each panel is well paced with a move, then a counter-move, and then another move. The layout is clear and, of course, the bigger moments get the bigger panels to emphasize someone's dominance in the fight. Meanwhile, the Conclave overlooks the battle from a safe distance as if they can distance themselves from this exercise in brutality. They're looking down, as they often do in this world of the haves and have-nots, on the combatants proving that from the Roman Empire to the empires of the Carlyles and Hocks, respect still comes from the sweat and blood of its gladiators. Although, this series doesn't rely on action or violence. It easily could if Rucka chose to go that route. What he's been able to do is create a compelling read based on the nuances and dramatic turns of a feudal society where maintaining and protecting your holdings is paramount. And if you can destroy your rival along the way then all the better. 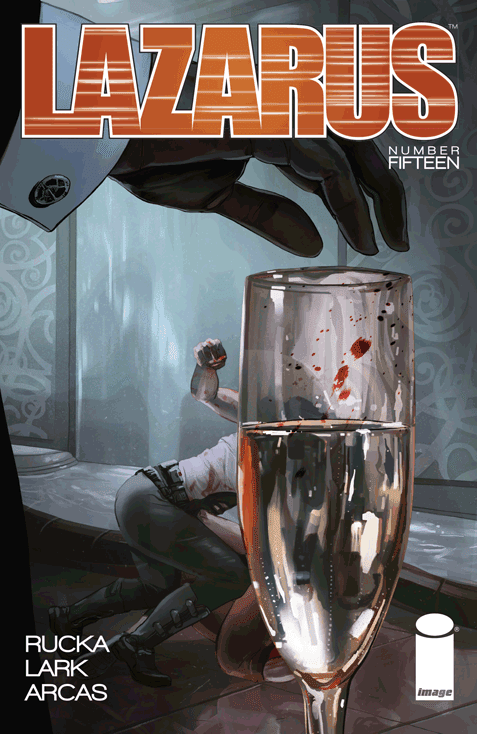 Issue 15 is an exciting entry point for new readers as well. There's plenty of background and quick exposition to catch up the reader right before the battle ensues and leaves off on a point that is totally accessible. I know it's an odd thing to say at the end of an arc, but that's how well the execution is in the issue - flawless. Just don't expect this level of action every month. Instead, enjoy the backstabbing, the intrigue, the continued world building but most of all stay for one the best characters in comics - Forever Carlyle.